This post is linked to Friday Foodie Fix–Pasta. When one experiences the wonder of adoption, one just has to share the experience—the love … the joy … the feeling of belonging. No, I’m not talking about bringing any little ones into our home. (Son is 22 now; my child-rearing days are behind me.) Instead, I’m talking about Sea’s (Book of Yum) Adopt a Gluten-Free Blogger program. Sea started this event quite some time ago as a way for gluten-free bloggers to get to know each other and to promote awareness of other gluten-free blogs. I had read about her event, and in my reading of other blogs, I’d seen where folks had been adopted, but I hadn’t really looked into all the details. Then last month, I followed a trackback link from my blog to Alta’s site, Tasty Eats At Home, which has become one of my very favorite blogs in just a short time. (Alta cooks with real food and is always up for a cooking challenge. One of my favorite Tasty Eats features is Kids in the Kitchen where she spends quality kitchen cooking/baking time with her children. You won’t want to miss Alta’s blog!) To my delight, Alta had adopted ME as part of Sea’s program. Boy, did I feel special! I was thrilled and grateful for Alta’s post with her extremely generous words. It was also a treat to see Alta’s variations on my chicken tenders and perfect pound cake. I immediately knew I just had to pay this kindness forward. A whole list of wonderful gluten-free blogs ran through my mind. There really are a huge number of them now, and all of them have something to offer depending upon your gluten-free needs and wants. Thankfully—and thanks to Sea—this is a monthly event, so I’ll have many more opportunities to adopt great gluten-free blogs. For this month, I’ve selected the blog, No Gluten, No Problem (NGNP), which is a collaboration of the amazing husband-wife team of Pete and Kelli Bronski. I’ve been following their blog for well over a year now. Kelli is a veteran of the hospitality and restaurant world. She’s a little bit more behind the scenes these days, with their young daughter Marin. But, occasionally, we’ll see her baking genius, as we did recently with Cream Puffs. It’s Pete who is usually out front and center on the blog. He is an award-winning writer who enjoys cooking greatly, and has since childhood. He’s also an endurance athlete. He and Kelli’s foray into gluten-free cooking began when he was diagnosed with celiac in 2007. Their blog’s subheading reads: Travel, Adventure, Commentary and Fresh and Delicious Recipes in a Gluten-Free World. As the main writer on their blog, Pete shares their latest cooking adventures, offers tips to athletes on gluten-free beverages and energy treats for competitions (and even provides some insight into preparing for and succeeding in such events), posts restaurant reviews (at home and on the road), offers information on the latest research on celiac and related topics, and, of course, treats us to their culinary creations. Pete and Kelli’s blog is really a collection of a little bit of everything, and I mean that in the very best way. Friday Foto is also a favorite NGNGP feature of mine. 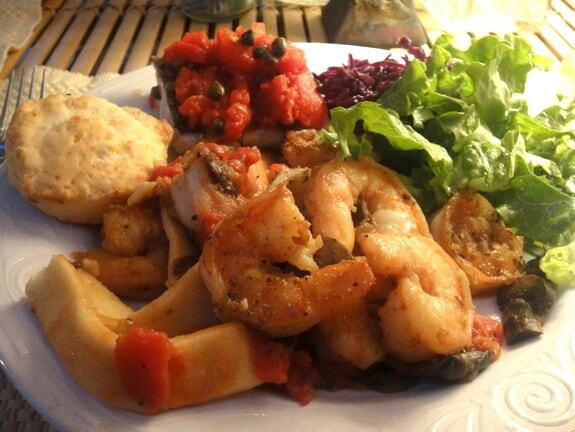 Some recent Friday Foto posts have been Grilled Old Bay Shrimp, Pan-Fried Dover Sole, Baguette, and Mussels in White Wine Broth. Hungry yet? You will be when you see the photos! There were so many possible NGNP dishes I could make. But two events popped up that helped me finalize my selections. A girlfriend invited me to join her at her river house for an overnight stay with another one of our girlfriends. Then Diane (The W.H.O.L.E. Gang) issued the Great Gluten-Free Pasta Challenge. Well, you know how I just have to respond to a challenge (e.g., Eating My Words)! So, pasta it would be. Pasta is actually a favorite of Mr. GFE’s. I enjoy it, too, but I admit I haven’t missed it greatly since going gluten free. We do enjoy gluten-free pasta from time to time, but not too often. However, I’ve always been intrigued by the idea of making my own pasta. Everyone swears that homemade pasta and packaged pasta are worlds apart. That’s the reason that Italian restaurants that make their own pasta (like Mangia Mangia from my Key West trip report) are always packed. Could I do it I wondered? 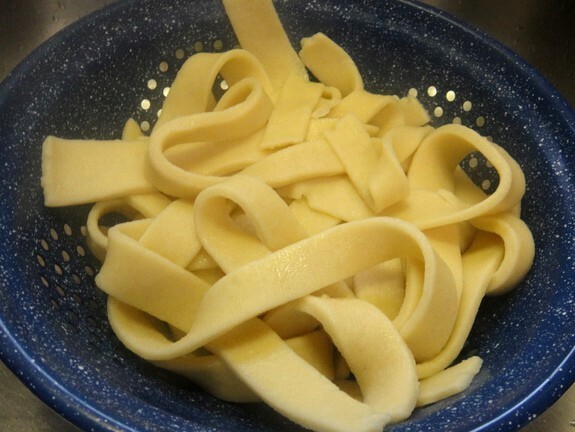 Pete swore making homemade pasta was so easy and his recipe did look simple. The photos were very appealing to say the least. 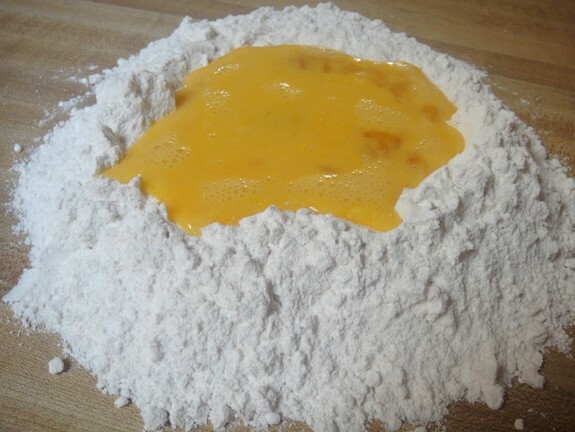 There are several posts on NGNP on pasta … their basic recipe for making homemade pasta, another on making ravioli using the original pasta recipe, and finally a recipe post on gnocchi. I followed the basic recipe (varying their signature flour mix slightly due to intolerances to other ingredients) and then cut my pasta into wider noodles, perhaps a little wider than fettucine. Scroll through the photos below … I DID IT! Are you impressed? I was. My girlfriends were as well. Thank you, Pete and Kelli! 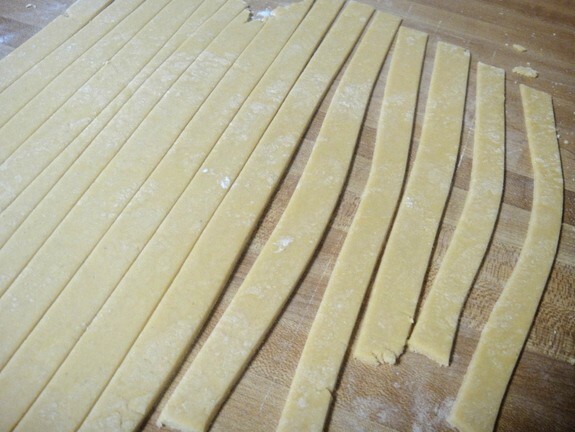 And, they were right … making homemade pasta using their recipe is not hard at all. This dough was easy to make, easy to roll out, easy to cut; it didn’t fall apart at any time (even when cooking! ); and it tasted wonderful. Next I’ll be trying their ravioli recipe. 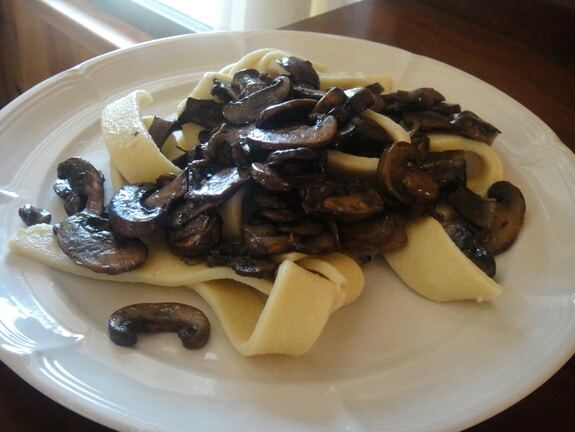 To top my pasta, as you can see from the photos, first I sautéed some Baby Bella mushrooms in olive oil, which makes for a lovely vegetarian meal. But, my friend, who was the main chef for the evening (her river house kitchen is best used by one person at a time) prepared Shrimp Marinara Sauce—another recipe of Pete and Kelly’s—as I read the directions out loud. She chopped and sauteed … first, onions and garlic in olive oil; then shrimp; and finally, diced tomatoes with basil, oregano, salt, and pepper. 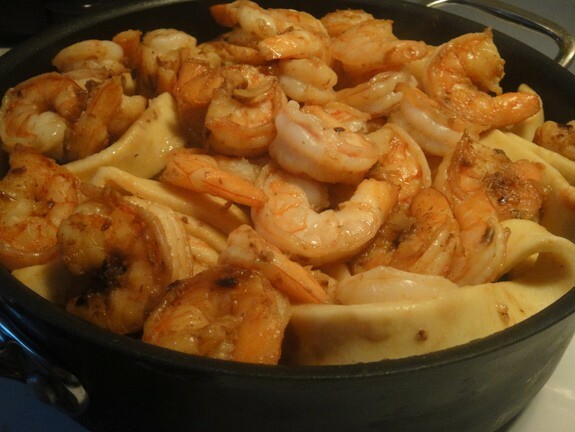 This recipe is very easy to make, but offers simple, sensational flavors. This specific recipe is not on their blog, but instead comes from their cookbook, Artisanal Gluten-Free Cooking, which came out last fall. However, their marinara recipe shown here at NGNP is the same, just without the shrimp. Upcoming girlfriend time also required a dessert. I wanted chocolate and I wanted a dessert that was both easy and travel-friendly. Again, I turned to Pete and Kelli’s cookbook. 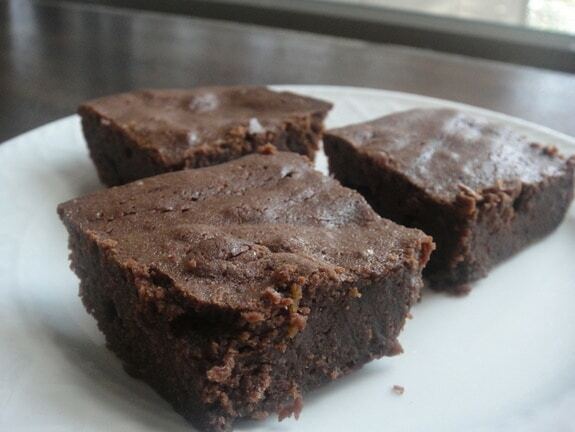 The answer came in the one-word recipe that met all my requirements and always appeals to everyone—brownies! Pete and Kelli’s recipe calls for butter; however, I needed dairy-free brownies as my one friend avoids dairy. Therefore, I used a combination of olive oil, coconut oil, and cocoa to take the place of the butter and unsweetened chocolate. The resulting brownies were fantastic—dense, dark chocolate, with just a bit of a coconut undertone. Head over to Pete and Kelli’s No Gluten, No Problem blog and take a look … I know you won’t be disappointed. But, here’s the best part, you can also head over to my Out and About page to read my (and others’) review of Artisanal Gluten-Free Cooking! Isn’t pasta fun to make? I need to do it more often! This recipe looks fantastic =D. Just out of curiosity, how much flour/eggs did you use for how many people, and which gf flour blend did you use? I read their recipe and yours doesn’t look like you used brown rice flour, it looks white. And it looks deee-lish! That pasta looks amazing! I’m intimidated by the very thought of making it myself. Is it really that easy? Hey Iris–Thanks! But, guess what … it’s just so easy. 🙂 Talk about looking like a rock star in the kitchen with little effort! ;-0 You should try making some. FYI–Diane also has another basic pasta recipe on her site for the Great Gluten-Free Pasta Challenge. I have a problem. My sister in law is allergic to rice and will be staying with us for a week or two starting the 17th. All the pasta recipes I see include rice. Do you know of a flour that I can substitute that will work and taste good? She is so picky. Wendy–Had to come back and address this question. Of coure, there are commercial gluten-free pastas that don’t contain rice. Some are made with corn, some are made with quinoa, and some buckwheat. So it makes sense that you could make a gluten-free, rice-free version. Pete and Kelli’s latest version uses their signature flour blend, which contains sorghum, so perhaps that could be used plus one of these other flours in place of the rice flour in the mix. I saw you left a comment at NGNP, too. Hopefully, Pete will have ideas for you as well. I’m totally with you on not cooking wheat pasta in my house. Good luck with your experimenting! If I find any more recipes that meet your requirements, I’ll be sure to let you know. I totally forgot about Adopt A GF Blogger this month! Shame on me. It’s just been a crazy past few weeks. I’m excited to check this blog out – I’ve made GF pasta once, but it wasn’t that great, and yours looks superb! Congrats on jumping on board with the Adopt a GF Blogger program, and thanks so much for YOUR kind words! Hi Alta–I believe we can do it all, just not all at once. 😉 I’m sure you’ll catch up with Adopt a GF Blogger later when you aren’t doing tons of other things. You stay plenty busy, and you just got back from vacation, too! I sure hope you have success with gf pasta the next time around … I was so very pleased with Pete and Kelly’s recipe. What fun to be able to make gf pasta at the drop of the hat, exactly the way one wants. 🙂 I’m especially excited about making lasagna. 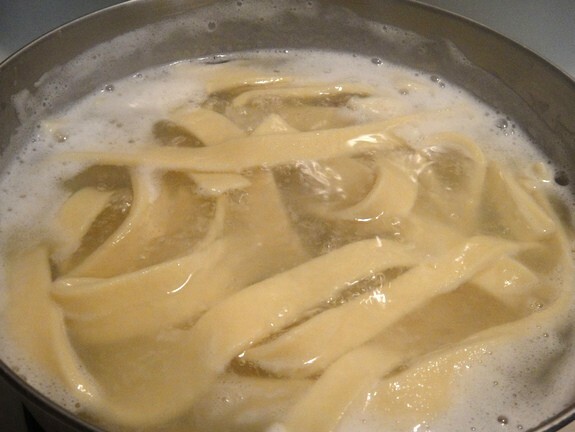 When making it homemade, you can just cut your pasta dough into a sheet to fit the pan (and make sure you have enough liquid in your recipe to cook the pasta). Very cool I think. Thanks so much and best of luck to you in the giveaway! Wow, I am drooling… but in a good way! That pasta looks awesome, like real pasta and not some gluten free gunk! I so want to try to make it now, thanks for the inspiration! Wow Shirley you’ve totally inspired me. I’ve always wanted to make my own pasta but since we had to go gf I thought it would never happen. I am going to have to try this and send Diane a pic! You make it look easy (gfe!haha). I often use sorghum flour to replace rice flour so maybe Wendy could try that? Hi Maggie!–Sometimes it surprises even me how far the gfe approach can take you! Soon, I’ll see a delectable pasta photo on your blog … I just know it. 😉 Thanks for the suggestion for Wendy. Since sorghum is used in Pete and Kelli’s current flour mix, which they use to make pasta, I do think it could be the main ingredient. Good luck to you in the giveaway! Quite a few years ago I did a pasta making demonstration at a support group meeting. Then better pastas became available and I got hooked on Tinkyada. I haven’t made it in a while, but it’s really quite easy, especially with a pasta machine to roll and cut the dough. Your pictures might motivate me to pull that pasta machine out again. I’ve been noticing more and more gluten-free options able at my local market. That’s a good thing:) I’m looking forward to seeing you back at Crock Pot Wednesday this week. Thanks for linking up last week and entering the giveaway. Hi Debbie–My favorite gluten-free options at the market are the ones that have been there all along … real food. 🙂 It’s nice to have a few gf specialty items though. I do buy some crackers and other things like pasta. I love Pete and Kelli’s cookbook although I haven’t taken on homemade pasta yet. I’m impressed, Shirley. This looks wonderful. And although it’s not even 6 AM yet, I WANT one of those brownies. They look decadently delicious! By the way, it’s snowing here again. Blowing snow, blizzardy and unspring-like, to say the least. And here you are, off to Asheville. I’m soooo jealous! Have fun and safe travels, my friend. Snow??!! It’s 81 in my living room right now. Seriously. I’m surviving by the grace of the ceiling fan blowing on me. I hate air conditioning so I’m determined NOT to turn it on. It’s supposed to really cool down by Friday though, here and in Asheville–yippee. (But, no snow … I hope!) Thanks for the good travel wishes! Yes, you would love Asheville … very gf and earth friendly, funky, fun, etc. Hi Jen–Thank you! 🙂 If not for Pete and Kelli’s recipe, I could not have made that pasta. I just wanted to thank you so much for the suggestions to making gluten free pasta with out rice. I thanked Pete and Kelli too. I may not get industrious enough to do it while they are here, I’m getting really scared they are going to poison me the whole time they are here. With a toddler and little snacks like Cheerios being carried around. I’m just shuddering. But I’m going to try the Quinoa pasta. And use it as a side dish more often. Then when they leave I think I’ll try and make my own pasta with Kelli and Pete’s flour mixture subbing rice flour with quinoa flour and see how that turns out, for a night we have them over! I wrote a than you comment to them, but didn’t give them so much detail…hadn’t thought it out so much! I’ll let you guys know how it works!! Thanks again for all the help! You’re the best! And so are your readers! Thanks for all the suggestions! Yes, please keep yourself safe while you have gluten-eating visitors. I’ll keep my fingers crossed that all will go well. Remember you can protect your space and yourself without being difficult. Sometimes we forget we need just as much protection as someone who is allergic to peanuts. The reaction might be different (not anaphylactic), but the “foreign invader”—in this case, gluten—is still harming our bodies. Best of luck with family and pasta! I’m very happy to help. 🙂 And, I agree, my gfe readers are the very best! Hi Kay–Thank you, my ardent gfe supporter! I’ll be keeping my fingers crossed that you’ll have success. 🙂 I see that Pete and Kelli just added their signature flour blend to their site (which is fairly close to what I used), so I’m going to update the post with that link. I appreciate the kind words on the photos. I always stress over those! Still wanting a better camera … soon, I hope. Kay Pest….I mean Kay Guest! hearing about the connections made through gluten free bloggers almost makes me want to start my own blog (if only i had the time and a good name!). i’m fascinated by the pasta you were able to make. while i’ve tried gluten-free sweet potato gnocchi, i’d LOVE to be able to make my own fettuccine! thanks! Please report back if you give the fettucine a try! Thanks. Great job with your pasta, it looks great!!!! I made a variation of your pound cake into muffins,they were delish! Very good. Thanks for “adopting” us! You were one of our earliest blogging buddies when we first started NGNP in mid-2008. I really value our friendship and the camaraderie between GF bloggers. Have a great trip with your girlfriends! Hi Pete–It was my pleasure to “adopt” you! 🙂 Thanks so much for offering your cookbook for this giveaway and for your kind words. I think all of us gluten-free bloggers feel that bond and are extremely grateful for it. Yes, I must make the lasagna just to try the pasta in sheets! I’m assuming that you don’t precook that, but instead ensure that there’s enough liquid to properly cook it during the baking of the lasagna as a whole. I want to jump into those plates they look so good! Lucky bloggers to get adopted by you! Hi Anali–So nice to see you! 🙂 I enjoyed some fabulous food with my gf girlfriends that weekend … well, that’s always the case really. 😉 We’re very lucky. Thanks so much for stopping by … need to visit Anali’s First Amendment soon! apply your basic lotion again, to the areas mentioned before.